Posted on November 6, 2015 by Appropos / This entry was posted in Product Reviews and tagged E-cagarette, e-cig, e-cigarettes, eleaf, Electronic Cigarette, Electronic Cigarettes, ismoka, iStick, smoking, vaping, vaporizing. Bookmark the permalink. Eleaf-iSmoka is a Chinese company that has been around since 2008. Their popular e-cigarette battery mod, the iStick comes in a variety of models ranging in wattage from ten to a hundred with watt temperature controlled models available. The company also sells a variety of atomizers/tanks. And a few of their products come bundled in kits which make them immediately usable without needing to purchase pieces separately. The 10w Mini iStick is Eleaf’s lowest wattage model. It is only available in mini format which is a smaller, simplified version of the standard size 20w iStick. It is very easy easy to hold and transport when fully assembled. There is a circular display on top that indicates how much charge is left in the battery as well as current voltage and vaping seconds. The size of this device is 21 mm * 32.5mm * 52mm. It comes in black, silver, red, and blue. The device can be turned on by 5 consecutive clicks of the power button. 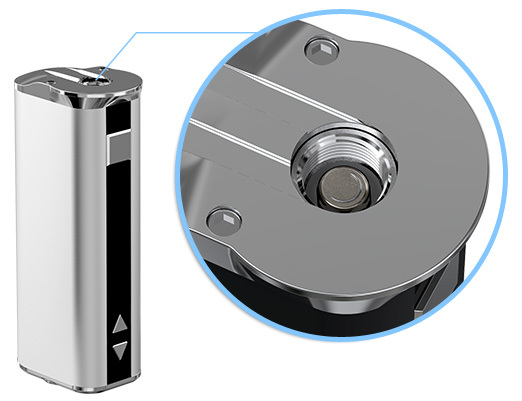 The up and down buttons on the front of this device, which are common on iStick models, adjust the voltage between 3.3V-5.0V. The device has a 10W max voltage with a battery capacity of 1050mAh, which is higher than many larger size battery mods. The charger port is located on the bottom of the device, which is common with many iStick models. This makes using the device a little inconvenient while its charging, but it is still possible. The battery takes approximately a half hour to an hour and a half to fully charge with the included 1A wall adapter. It has a 510 thread type but all iSticks come with an adapter that makes them compatible with eGo atomizers. There are various safety features in place on this device such as a ten second shut off if the fire button is held for ten seconds or longer, short circuit protection, and an automatic shutoff once the battery reaches 4%. This is the original iStick. It is quite a bit larger than the 10w mini model, measuring in at 75mm*21mm*32.8mm. It comes in black, silver, red, and blue and has a 2200mAh battery capacity. This mod has the same safety features as the mini 10w model: a ten second shut off and short circuit protection. The oled screen is on the side of this device rather than at the top. It displays battery condition, resistance, wattage and voltage. The voltage on this device can be shifted from three to 5.5. The charging port on this device, like the 10w, is located on the bottom. Pressing the button five times on the front turns the device on and off. Pressing it three times shifts it from variable volt to variable watt and vice a versa. Something nice that is different about this model compared to the 10w is that you can purchase various case options such as one produced by Eleaf made out of leather as well as some decorative stickers that they sell. The iStick 30w Sub OHM looks almost exactly like the original 20w iStick. The only visual difference is an added ledge on top which helps streamline the device, making it so that bigger atomizers like those in the 22 or 23 mm range don’t hang off. The charging port is located at the bottom of the device. The buttons and the screen are in the same location as the 20w. This device has a spring loaded center pin as well as wear resistant threads. There is also a lock feature added to prevent accidental changes to wattage while vaping. This feature can be activated by holding the up and down buttons for two seconds. The device can be set from 5 to 30w. It can fire to 0.4 ohms. Like the 20w device, the 30w has a 2200mAh battery. It is a good device for vapers looking for a more powerful vaporizer with the capability to vape sub ohm. The iStick TC 40w introduces temperature control into the iStick line. It is a 40w device that can also vape in temperatures between two hundred and six hundred degrees. It is one of the smallest temperature control devices on the market, being not much bigger than an original iStick. It has a 2600mAh battery and is charged from the bottom of the device. The buttons are a little different than the previous models with the inclusion of a button on the front of the device, located between the up and down arrows, which allows the device to be shifted from temperature to wattage mode. The fire button on this device is round instead of square. One of the coolest upgrades is that the threading has been moved to the rounded backside of the top, eliminating the necessity for the overhanging lip featured in the 30w device while still being able to fit larger tanks. This device has an all stainless steel, spring loaded threading connector. It adjusts in 0.1 increments, going all the way down to 1.0 watt and up to 40. watts. In temperature control mode, the device can be switched from Celsius to Fahrenheit by going all the way to the top or bottom of the temperature unit and rolling over. It can vape from 2 to 600 degrees Fahrenheit in increments of five degrees. You can flip the way the display button is shown by holding the up and down button for about five seconds while the device is off which makes the display readable from either hand. The iStick 50w is larger than the original 20w device. It measures 45*83*23. It goes all the way up to 50w and down 0.2 ohm resistance. A great distinguishing feature of this device is that the charge port is located on the side of the device, making it much easier to use. There is a bigger power button on the side and the menu and up and down buttons are on the front. This device locks by holding the plus and minus button at the same time so that the settings can’t be changed while firing. The screen displays wattage, voltage, and battery life. There is a 510 thread with eGo adapter. It has a spring loaded center pin. The battery is very large: 4400 mAh. It will last many average vapers about a week or longer. This device has temperature control protection, so if it is too hot or too cold it will shut off. 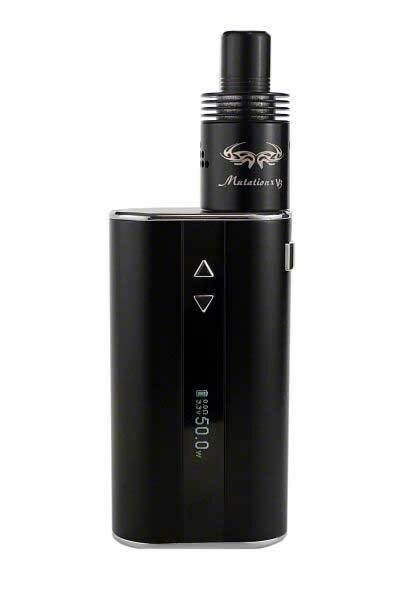 This is a more portable 50w device in comparison to many of those on the market. It switches between variable wattage or variable voltage and works between 2 and 10 volts or 5 and 50 watts. It has a resistance range from .2 ohms up to 5 ohms of resistance. Clicking the button three times shifts the device between wattage and voltage modes and holding the button down causes the settings to scroll. The 60w iStick is another Temperature Controlled model. It has a spring loaded center pin that’s right in the middle of the top of the device. Another main distinguishing feature of this device is its absence of a built in battery. It uses one 18650 battery that fits into a slot on the back that is covered with a magnetic cover. The batteries can be recharged by a bottom located micro USB slot. The temperature range on this device goes from 2 – 600F and it can fire on .15 coils all the way down to .05. The controls have shifted a bit on this device. The fire button is located nearer to the top. The additional third button that was present on the 40w is also present here, switching the device from wattage mode to TC by pressing and holding it for 2 seconds. This model also has exchangeable panels which allow you to mix and match colors. Eleaf’s take on the 100 watt vaporizer mod, combines the power of other high wattage devices with the ease of functionality and comfortably smooth design that the iStick line has become associated with. It is larger than the other iSticks but has a shape that is nice and rounded to fit comfortably in the hand. It has a magnetic removable hatch on the front which opens up to the battery compartment. The device takes two 18650 batteries that can be charged via the USB port on the device’s bottom. There is a spring loaded connector pin and a 510 to e-go adapter making this device capable with any tank. It comes in silver and black and has a 5 – 100 watt range. Hitting the fire button five times switches the device back and forth between wattage and voltage mode. In voltage mode it can fire from 2 volts up to 10 volts. Pressing the fire button five times turns the device on and off. Holding the + and – buttons switches the screen back and forth between left and right handed use view modes. This device also has an improved ventilation system, keeping it cooler than the other iSticks. Eleaf’s iStick line is a great product with great features. It is perfect for anybody looking for a steady, working mod without much hassle. The mods consistently make it onto top product lists. The brand is very focused upon leaving their mark upon nearly every aspect of the market. They consistently surprise people with what they have to offer. They make products which are applicable for both the seasoned vapers and those just getting into vaping. Whatever vaping experience you are looking to have, you can be confident that there will be an iStick to help you achieve it.